We'll compare the European medical knowledge carried by expedition members with the tribal medicine the Corps encountered on its trek across the continent. The expedition offers a useful perspective on the relative merits of distinct medical traditions. The history of the expedition has lured hundreds of thousands of Americans to significant sites along the Corps of Discovery's trail, and to books and events digging into every element of the expedition. Many have become academic and armchair experts on the subject. We'll meet a number of them and find out why they've chosen to enter the world of Lewis and Clark and how they share their enthusiasm for the story. Produced by Oregon Public Broadcasting and Lewis and Clark College, Unfinished Journey, The Lewis and Clark Expedition is a 13 part series, narrated by Peter Coyote. This landmark series was carried nationally on over 80 NPR stations and covered a diverse number of topics relating to the Lewis and Clark Expedition. Dr. Peck was a featured participant in two of the episodes. These episodes are featured here in their entirety for your pleasure, courtesy of Oregon Public Broadcasting, Portland Oregon. 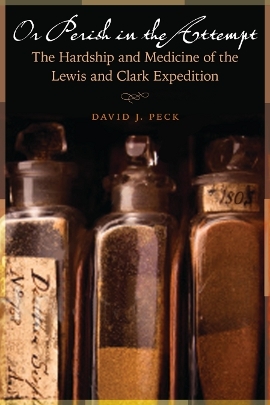 Clay Jenkinson, the new editor and director of Discovering Lewis & Clark®, is the author of the most recent featured addition to the site"